Hello, Inspy Friends! Do I have a treat for you! I wanted to share with all of you a newly released boxed set, Speedway Romance~Racing Series by Author Debra Ullrick. 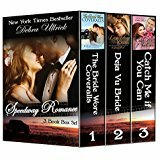 Debra has taken three of her bestselling books and put them all into one wonderful boxed set. Love sneaks up on you when you least expect it. 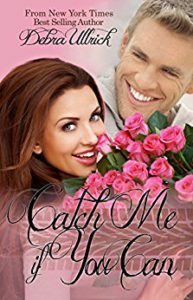 Three very different women with three very dissimilar backgrounds all have one thing in common—Speedway Romances. The last thing Audra Darron wants is another disastrous relationship. When the persuasive Barrett Camden challenges her to a date, she accepts his challenge. It doesn’t take her long to learn under all that macho exterior is a kind man with a tender side. A mystery man full of secrets, something she detests. Does she dare trust him when he asks her to without knowing his past and risk her heart? Barrett Camden is a man with many names. It’s been seven years since he went into hiding. When he sees the gutsy little beauty wipe out her competitors in a demolition derby, he’s determined to get to know the feisty woman. The only problem is, she’s not interested. Not the least bit discouraged, he pursues her, but soon discovers his past may very well keep him from catching her. 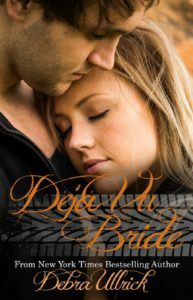 Debra has graciously offered to give away a kindle copy of Speedway Romance to one lucky winner. Also she will be popping in from time to time, so while she’s here visiting with us, does any one have any questions for her? Debra Ullrick is a New York Times, CBA, and Amazon.com bestselling author. Her titles include: A Log Cabin Christmas, Forewarned, Catch Me if You Can, A Cowboy for Christmas, The Dreamer and the Cowboy, Say it with Roses, A Forever Thing, Reunited at Christmas, Christmas Belles of Georgia, A Recipe for Romance, A Dozen Apologies, Dixie Hearts, The Bride Wore Coveralls, Deja vu Bride, The Unexpected Bride, The Unlikely Wife, Groom Wanted, Colorado Courtship, and The Unintended Groom. A lot of Debra’s inspiration comes from her real life hero, her hottie cowboy husband of forty plus years. And she uses some of her only daughter’s antics in her books as well. Debra and her husband lived and worked on various cattle ranches throughout the Rocky Mountains for over twenty-eight years. The last ranch they lived at, a famous movie star and her screenwriter husband purchased property there. Another ranch they worked on, Kurt Russell hunted on it, and her husband had the privilege of taking Eddie Albert horseback riding. Hmm, an interesting set- I can only think of one other Christian romance connected with speedway racing (one by Dora Hiers). It is always fun to read about different jobs/industries. Wemble, I will have to check Dora Hiers’ books out. I love racing. So thank you. And thank you for stopping by. A double dose of Debra…what a great way to start the week! Thanks for visiting Inspy today. Are you a big fan of Nascar? Jill Weatherholt, in school there were lots of double, triple, quadruple doses of Debra’s. Seems that was a very popular name back them. *smiling* Ironically, Jill, I’m not a huge fan of nascar. Only because there are way too many laps to keep my interest. I like fast and more action. With mud bog racing you get that. Same with monster trucks and dirt track racing. Thanks for visiting with us, Jill! Thank you, Linda, for stopping by. Hello, Linda! Thank you and all three books are great! This boxed set is really exciting. Thanks for sharing. I’ve been wanting to read all three books for a while. I’ve started Dejavu Bride but for some reason that I can’t remember I didn’t finish at the time and it got away from me. I remember being really into the story. I’m definitely moving it to somewhere I can see it/ remember it when I finish what I’m currently reading (one thing I’ve noticed about kindle is that I can get disorganized pretty quickly and loose track of books). Priscila, I know what you mean about Kindle and your books getting away from you. I have the same problem. I have so many that I forget what I have and then when I see someone talk about a book I go to buy it and realize I already have it. Wish there was a way to organize them. Thank you for stopping by. I need to check my list to see if I have them. I have so many books I can’t remember all of them. And yes Go God. He’s truly amazing. Thank you, Angie Carroll. And thank you for stopping by. Hello, Angie! All three stories are wonderful! The very first book I read of Debra’s was, The Bride Wore Coveralls, and I have been a big fan of hers ever since. I have every one of her books on my Kindle now, and I also have some of them in paperback, too. She’s a wonderful author and great story teller!! All three books sound really good! Thank you, Melanie D. Snitker. And thank you for taking the time to stop by. Good morning, Melanie! They really are. I can say that because I have already read all three books, and I loved each one of them :) This is a great racing series. Thanks for inviting Debra to Inspy Romance, Debra! This sounds like a fun set of books. I’ll see if I can’t get a conversation started! Debra U, what drew you to writing about women in this male-dominated field? Was it difficult keeping the women “feminine”? Valerie. I love anything to do with racing. Especially mud bog racing and monster trucks. I love the south and how sweet Southern women are. So, I thought it would be fun if I created a character who was sweet, sassy, and loved to race but the men didn’t think it was right that a woman should race. They were jealous is why. I wanted to show that just because you love racing, monster trucks, mud bog racing, and classic cars (all four of those are me) that you can still be feminine. tToday women race all the time and most people don’t think anything of it. But at the time I wrote the books it wasn’t really that way. And mud bog racing was just catching on. Now it’s huge. In some ways, Valerie, it was a struggle keeping them feminine, but in other ways, no. All I know is, I had a blast writing them. mimionlife, that’s awesome that you’ve been to several races. My nephew raced dirt track and mud bogged. Both were very expensive and they’re nothing like Formula1 racing. Thank you for stopping by! I’ve read these books from the library but don’t own copies. Loved the stories. Developed my love of Camaros from reading these books! Would love to own the boxed set. Thank you for sharing this giveaway with us. Wow, that’s interesting that you got your love for Camaro’s from my book. I love classic cars. My hubby is restoring a ’70 Nova right now. Can hardly wait until it’s finished. Thanks for stopping by. I’ve never finished reading this series. I’m so excited. I love Debra’s stories. What, Gingers219? Only a few?? hehe Just teasing. Thank you for stopping by and for adding the link. I wanted to be a blessing to my readers and let them have a chance to read all three books in the series for a great price. Hope they enjoy them. A lot of heart and soul and myself went into these books. Ginger219! Thank you so much for adding the link. I can’t believe I forgot to do that! You’ll love this series, it’s great! These sound interesting & fun! I don’t think I’ve ever read a book centered around drag racing. Sounds interesting! Hey, Melynda! 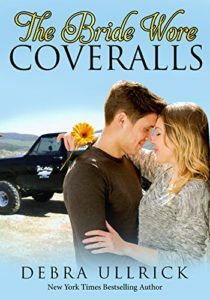 The Bride Wore Coveralls was the very first book that I’d read that was centered around racing, and I enjoyed it tremendously! Melynda, the first book is centered around mud bog racing. The second monster trucks and the third, demolition derbies. Haven’t done one with drag racing. Ohhhh, do I feel a story idea coming along? hehehe Thank you for stopping by. This sounds like a great set. What prompted the interest in racing??? Great post! Thanks for sharing. Mountain Lake is close to us, where they filmed Dirty Dancing. One of my husband’s friends was Patrick Swayze’s chauffeur. Another friend of his, the log scene was filmed on their property. These stories sound great! Wow, Sally Shupe, that is soooo interesting. It’s always fun to hear about stars and who they’ve met etc. When we lived on one of the ranches we did, my husband took Eddie Albert and the owner on a horseback ride. Kirt Russell hunted on the ranch. And another ranch we were on…Michelle Pfeifer and her husband David Kelly owned a parcel on it and my husband took care of their place. Sad part is…I never got to meet any of them. Drat. Oh well. hehe Thank you for stopping by. That is so interesting! I hate that you didn’t get to meet them! That would have been fun. Thanks for giving us snippets of your books in this set Debra! Those stories sound fun. How did you decide to put them in a boxed set? This sounds like a great collection! Thanks for sharing. Ooh, this looks really neat! I hadn’t heard of mud-bog racing before this. I’m excited to check this series out! I am from down under in New Zealand and would love to win some books have been a book worm since 9 years of age. I am original Afrikaans speaking from South Africa but am now a New Zealander citizen. I have travelled a lot and even worked In Saudi Arabia for 5 years.